The smell was an acrid burning, very unlike the cool sea breeze that usually wafts off the harbor and drifts down Connaught Road in Central, Hong Kong. 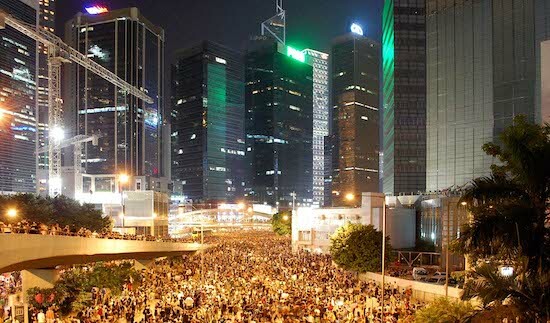 In Admiralty, I knew, there were students lined around the Tamar government buildings. Earlier I had seen the protestors shouting and shoving past barricades before the pepper spray began. It was hard to believe the same students who had written me polite emails explaining their reasons for protesting and thus being absent from class would one minute make promises to complete all their assignments, and the next minute be the source of this burning and smoke. As I walked across the abandoned street, stepping over empty water bottles and cardboard boxes, I remained skeptical that these same students would cause any violence. And as I came closer to the ramble of dark figures perched on median strips in the road and scattered in the streets, I wanted to see what could possibly be destroying my city. Saying the phrase “my city” in reference to Hong Kong and not Long Branch, New Jersey, where I was born still strikes me as partially profound and partially profane. When I told people back in New Jersey about being tear-gassed during the protest, they replied, “Why would you put your life at risk? You’re not Chinese.” I am not Chinese. I am African-American; in Hong Kong, children will point at me, old men will stare rudely at me, and the customs officials will always pull me out of line at the airport to be searched. Yet the lush hillside backdrop of this city is as familiar to me as the crisply cut suburban lawns of my American childhood. In the years I have lived in Hong Kong, I have realized myself, grown creatively, and matured personally in the city’s closet-sized apartments and stifling humidity, while I have listened to the clink of Mahjong tiles and the phlegmatic cough of its old men, smelled the scents of ripped open slabs of cows in the markets and the fragrance of sun-drying abalone. I could live the rest of my life somewhere else but suddenly always have a yearning to taste the syrup of iced lemon tea. It would be the nostalgia of home.